The initial banner o East Germany adoptit in 1948 wis identical tae that o West Germany. In 1959, the East German govrenment issued a new version o the banner bearin the naitional emblem, servin tae distinguish East frae West. ^a Dissolved bi the Volkskammer on 8 December 1958. ^b Population statistics accordin tae Statistisches Bundesamt. ^c Althou .dd wis reserved as correspondin ISO code for East Germany, it wis nae entered tae the ruit afore the kintra wis reunited wi the wast. 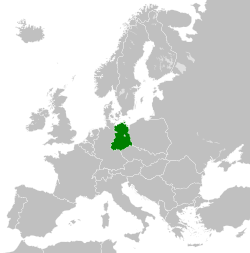 East Germany (German: Ostdeutschland), formally the German Democratic Republic or GDR (German: Deutsche Demokratische Republik, ([ˈdɔʏtʃə demoˈkʀaːtɪʃə ʀepuˈbliːk]) or DDR), wis a state within the Eastren Bloc during the Cauld War period. Frae 1949 tae 1990, it admeenistered the region o Germany which wis occupied bi Soviet forces at the end o the Seicont Warld War—the Soviet Occupation Zone o the Potsdam Agreement, boondit on the east bi the Oder–Neisse line. The Soviet zone surroondit Wast Berlin, but did nae include it; as a result, Wast Berlin remained ootside the jurisdiction o the GDR. This page wis last eeditit on 12 October 2015, at 04:45.